Enter an enchanted world where all of the richest splendours are available for you to grasp. Click here to play! Enjoy your time at this wonderful slot and walk away with some stellar cash winnings. 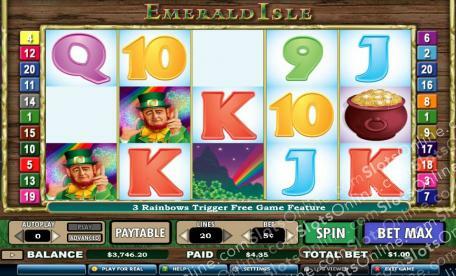 Emerald Isle is a thrilling 5-reel slot played across 20 unique pay lines. The Leprechaun is Wild and can be substituted into any other symbol except Scatters in order to finish winning combos. Spin him up on reels 1 and 5 and you’ll enter the bonus round, and land all five on an active pay line and be rewarded with 6000 times your initial wager. The Rainbow is Scattered and pays out whenever two or more appear on the reels. Land the free game feature by spinning up three or more Scatters from left to right. There is plenty to discover at Emerald Isle, so hop on down and start winning today! The Rainbow is Scattered and can not only earn you a free game feature, but also can appear anywhere on the reels in order to earn a cash payout. The Leprechaun is Wild and therefore can be subbed for symbols in order to complete winning combos. Land the Leprechaun on reels 1 and 5 and be treated to a unique bonus round that only Emerald Isle could create.